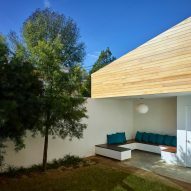 Expanding a remodelled bungalow in Los Angeles and connecting it to an adjacent commercial building has allowed architect Martin Fenlon to create more living spaces for his family and offices for his studio. Completed over the course of almost five years, the architect conceived the Fenlon House in three phases, and built it with a team of just two other people to keep costs down. 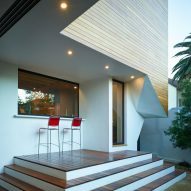 First, Fenlon renovated an ageing home in LA's Hermon district. The attic was converted into inhabitable spaces, and a new staircase was added to the exterior. "The ascent up the new spiral staircase is flooded in natural light from the skylight above while connecting to the new exterior deck below," said Fenlon. The upper floor now contains a seating area, roof deck, and small bedroom. 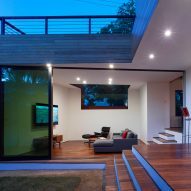 The public areas are configured as mezzanine levels, allowing residents to peer into the main home below. The second phase was to clear some space taken up by unauthorised additions made to the neighbouring commercial building over the years. "The storefront building, with its several bootleg additions, previously took up half of the site, exceeding the allowable floor area for the property and leaving little open space," said Fenlon. "In order to make space for the new yard and the 620 square feet [57.5 square metres] of additions to the house, over 600 square feet [55 square metres] of the storefront was demolished." The final step was to insert a new volume between the home and commercial building that connects the two, acting as a buffer between the home and office. Part of the regained area serves as a family room. The reconfigured ground floor now has three bedrooms, a kitchen with a breakfast island, and a dining area next to the new living room. "The expansion transitions the original house to the new yard and existing storefront, making one integral with the other," Fenlon said. On the office side, an open-plan work space connects to the home's shared back yard. A conference room allows Fenlon to host private meetings as well. The expansion takes full advantage of Southern California's characteristic warm weather. Sliding glass doors allow the family room to open fully, providing direct access to the new garden. For new additions, Fenlon maintained a palette similar to the original home. "The family room and stair hall are clad in the same materials as the original house remodel; torched cedar, clear cedar and white plaster," he said. The interiors have Acacia wood floors that complement reclaimed elements such as the roof structure from the original bungalow. 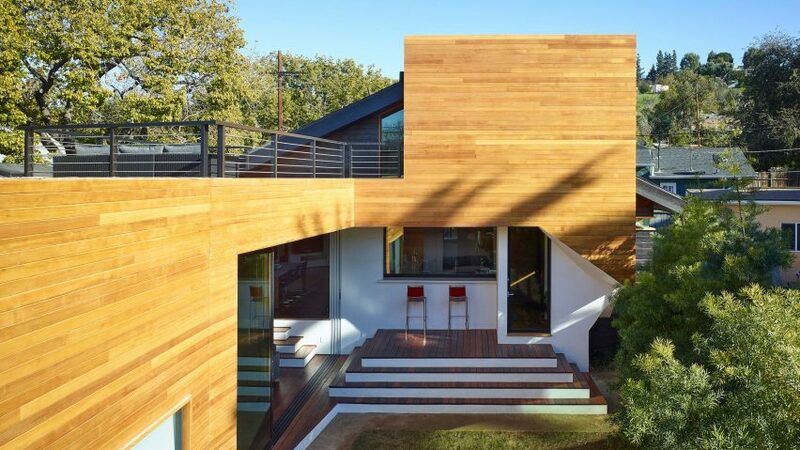 Fenlon set up his eponymous architecture firm in 2004, and has since completed projects that include a house in LA with that merges the styles of local 1920s bungalows and 1950s modernist buildings. Photography is by John Linden.